Pulmonary atresia (PA) is a heart defect that occurs due to abnormal development of the fetal heart during the first eight weeks of pregnancy. 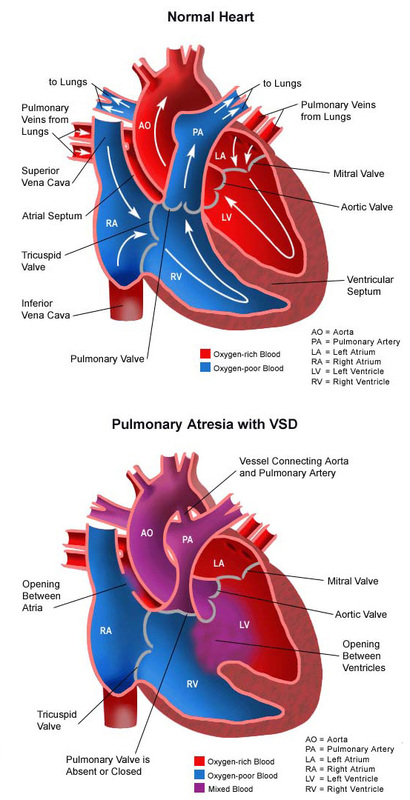 Pulmonary atresia means that there is an abnormal development of the pulmonary valve. The pulmonary valve is found between the right ventricle and the pulmonary artery, which is the large artery that goes to the lungs. It has three leaflets that function like a one-way door, allowing blood to flow forward into the pulmonary artery and to the lungs, but not backward into the right ventricle. With pulmonary atresia, problems with the valve prevent the leaflets from opening; therefore, blood cannot flow forward from the right ventricle to the lungs. Often, if blood is blocked from exiting the pulmonary valve, there is a second opening in the ventricular wall. The ventricular wall is the wall of heart muscle that separates the left ventricle from the right ventricle of the heart. This opening is called a ventricular septal defect (VSD). There may also be a second opening, or “hole,” between the two upper chambers of the heart—the left and right atria. This defect is called an atrial septal defect (ASD). These holes allow blood in the obstructed right ventricle a way out of the heart. The blood then ultimately crosses to the left side of the heart and is pumped out to the body. This situation cannot support life, because the blood never makes it to the lungs to become oxygenated, and oxygen-poor (blue) blood cannot meet the body’s demands for normal growth and function. Newborns will rely on a connection between the aorta and the pulmonary artery, called the ductus arteriosus. That allows some of the oxygen-poor (blue) blood to bypass the blocked right ventricle and get to the lungs. This ductus arteriosus is persistent from normal fetal circulation, and unfortunately, this ductus arteriosus normally closes within a few hours or days after birth. Because of the low amount of oxygen provided to the body, pulmonary atresia is a heart problem that can ultimately result in cyanosis, or a blue color to the skin from lack of oxygen. The problem occurs as the heart is forming during the first eight weeks of fetal development. Some congenital heart defects may have a genetic link, either occurring due to a defect in a gene, a chromosome abnormality, or environmental exposure, causing heart problems to occur more often in certain families. Most of the time, this heart defect occurs sporadically (by chance), with no clear reason for its development. Symptoms can be noted shortly after birth or several weeks later as the ductus arteriosus closes. The most obvious symptom is blue, or cyanotic, skin in a newborn. Blue color of the lips or skin. The symptoms of pulmonary atresia may resemble other medical conditions or heart problems, so it is very important to contact the child’s physician if you suspect the child may be experiencing any of these symptoms. A pediatric cardiologist and/or a neonatologist may be involved in your child’s care. A pediatric cardiologist specializes in the diagnosis and medical management of congenital heart defects, as well as heart problems that may develop later in childhood. A neonatologist specializes in illnesses affecting newborns, both premature and full-term. Cyanosis is a major indication that there is a problem with a newborn. The child’s physician may have also heard a heart murmur during a physical examination. Chest X-ray. A diagnostic test that uses X-ray beams to produce images of internal tissues, bones, and organs onto film. Learn more about chest X-rays. Specific treatment for pulmonary atresia will be determined by your child’s physician. Children with pulmonary atresia will most likely be admitted to the cardiovascular intensive care unit (CVICU) or neonatal intensive care unit (NICU) once symptoms are noted. Initially, the child may be placed on oxygen, and possibly even on a ventilator, to assist his or her breathing. IV medications may be given to help the heart and lungs function more efficiently. A cardiac catheterization procedure can be used as a diagnostic procedure, as well as an initial treatment procedure for some heart defects. A cardiac catheterization procedure may be performed to evaluate the defect(s), and the amount of blood that is able to get to the lungs to become oxygenated. Learn more about cardiac catheterization. As part of the cardiac catheterization, a procedure called balloon atrial septostomy may be performed to improve mixing of oxygen-rich (red) blood and oxygen-poor (blue) blood between the right and left atria. A special catheter with a balloon in the tip is used to create an opening in the atrial septum (wall between the left and right atria). The catheter is guided through the foramen ovale (a small opening present in the atrial septum that closes shortly after birth) and into the left atrium. The balloon is then inflated, and the catheter is quickly pulled back through the hole, into the right atrium, and a hole is created, allowing blood to mix between the atria. This procedure may also be done in the CVICU. An IV medication called prostaglandin E1 may also be given to keep the ductus arteriosus from closing. These interventions will allow time for your baby to stabilize his or her blood while more definite repair is planned. Ultimately, surgery is necessary to improve blood flow to the lungs on a permanent basis. The exact type of surgery needed depends on a number of factors, including the size of the right ventricle and whether there is a communication between the right and left ventricles (a ventricular septal defect or VSD). Your child’s cardiologist, heart surgeon and intensive care doctor will carefully review your child’s unique situation and explain their recommendations for treatment. What is the long-term outlook after pulmonary atresia surgical repair? The long-term outlook after pulmonary atresia repair varies from child to child. Children should receive lifelong follow-up care at a center offering pediatric (and ultimately adult) congenital cardiac care. It is not unexpected for further surgery to be performed to replace conduits or revise a palliation. After surgery, infants will return to the CVICU to be closely monitored during recovery. Arterial line. A specialized IV placed in the wrist or other area of the body where a pulse can be felt, that measures blood pressure continuously during surgery and while your child is in the CVICU. The child may need other equipment not mentioned here to provide support while in the CVICU, or afterwards. The hospital staff will explain all of the necessary equipment to you. After catheterization or surgical procedure, patients are kept as comfortable as possible with several different medications; some relieve pain, and some relieve anxiety. The staff will also ask for your input on how best to soothe and comfort your child. As your child recovers, you will be provided with instruction on how to care for the recovering child at home. Caregivers are provided written instructions regarding medications, activity limitations and follow-up appointments before the child is discharged. High-calorie breast milk or formula. Special nutritional supplements may be added to pumped breast milk or formula that increase the number of calories in each ounce, thereby allowing your baby to drink less and still take in enough calories to grow properly. Feeding therapy. Feeding therapists often work with babies who have heart surgery to help them learn how to eat. CHOC Children’s has developmental specialists who specialize in working with infants and children who have difficulty with eating. If your infant or child is not taking in enough calories by mouth for healing and growth, your physician may order an evaluation and treatment with one of our feeding team. Learn more about feeding and swallowing therapy. Pain medications, such as acetaminophen, may be recommended to keep the child comfortable. Your child’s physician will discuss pain control before the child is discharged from the hospital.